Ottoman beds are a functional piece of bedroom furniture that opens to reveal a generous storage space. Designed with the appearance of a traditional bed, super king size ottomans are an ideal solution when you require extra storage capacity. Ottoman style 6' divans have a shallow platform top which is hinged to the base with access to the storage area via a lifting platform. Connected to either the side or head end of the base via a hinged system, when lifted, this gives access to almost all the underbed area. Hydraulic or tension springs are incorporated into the design of the bed to make lifting and replacing safe and easy, even with a heavy mattress on top. The Staples Adlington 6' Divan Bed combines 1000 pocket springs, allowing the body to relax in a more natural position, with a natural cotton layer for enhanced breathability and moisture control. Finished with a silky smooth, luxurious Belgian damask top fabric this pocket spring bed has two rows of traditional hand side stitching for increased stability and is available with a choice of sprung edge, platform top or ottoman base. Available in two different styles including 6' ottoman divans and super king size ottoman bed frames, the raising platform in these models differ with ottoman-style divans having a narrow section constructed in a similar way to the rest of the divan base; whereas bed frames are designed with a metal frame section with sprung slats. The Natural Sleep Ultimate Flotation 6' Divan Bed combines 50mm layer of luxury memory foam that adjusts to body weight with a patented spinal zone for orthopaedic support. 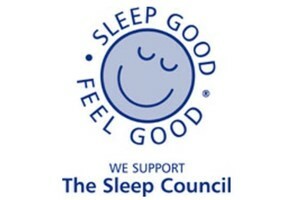 This award winning bed has a pocket sprung core with the softest, quality fillings and hand finished quilted top layer. Available in a range of colour and fabric base options with matching headboards, the Natural Sleep Classic Super King Bed also benefits from ottoman or drawer storage options. At Dazell's we retail a great selection of ottoman beds from leading bed manufacturers Dorlux, Balmoral, Staples, Slumber Night so you have a range of options to choose from. What's more, with our rapid Free Delivery Service and Free Recycling of your old bed throughout Northern Ireland and Counties Dublin, Louth & Monaghan, you'll not have to wait long to enjoy your storage bed. We’ll even remove & Dispose of Packaging and assemble your new bed in a room of your choice and provide Free Pillows so you can start enjoying a great night's sleep straight away. At Dalzell's we will provide Free Delivery of your new ottoman bed along with Free Pillows and Free Collection and Recycling of Your Old Bed when we deliver your new model. Our free delivery zone covers Northern Ireland, and Counties Dublin, Louth and Monaghan. We’ll even Remove & Dispose of Packaging and set up your new divan bed and mattress in a room of your choice. With additional discounts for Multibuy, and our Price Promise, you can be sure you're getting a great deal because we appreciate your business! For expert advice on all our ottoman divan beds call, email or visit in-store today. Delivery throughout the rest of Ireland available at Highly Competitive Rates.